Anapayini Devi Dasi then performed a Bharatnatyam dance to the song “Jaya jaya jagannatha sacira nandana” which is composed by Vasudeva Ghosh. This beautifully showed how Jagannatha, Sri Krsna, and Lord Caitanya are the same Supreme Personality of Godhead who has manifested in different ages as Rama to kill the demon Ravana, as Krsna to reveal the glorious pastimes of Goloka Vrndavana Dhama, As Jagannatha in Nilacala Dhama, and as Lord Gauranga to preach the chanting of the Hare Krsna maha-mantra. Anapayini Devi Dasi, accompanied by Vishvambara and Vrnda Devi’s daughter Naimisaranya, showed by Her dance that the sankirtan movement of Lord Caitanya is blissfully performed and is available to everyone without consideration. 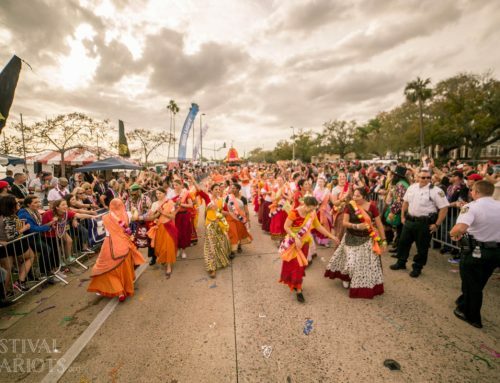 Bhadra Prabhu then thanked and offered gifts and prasadam to all of the residents of Daytona who were instrumental in supporting this Rathayatra, as well as the devotees who were instrumental in making this festival happen. 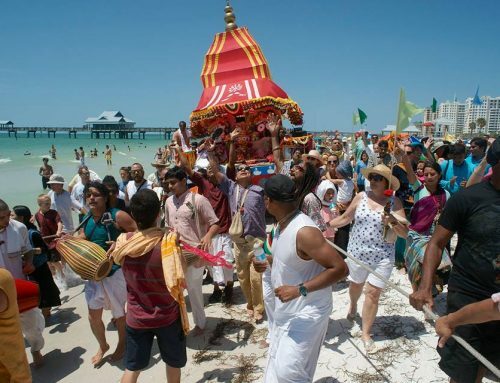 We pulled the Cart of Their Lordships Jagannatha, Baladeva, Subhadra, Sudarsana, and Srila Prabhupada down the beach and many beach goers were thrilled to join us as we chanted and danced for the pleasure of Lord Jagannatha. It was inspiring to see people of different races, ages, and nationalities joining hands and dancing blissfully for the Lord of the universe. 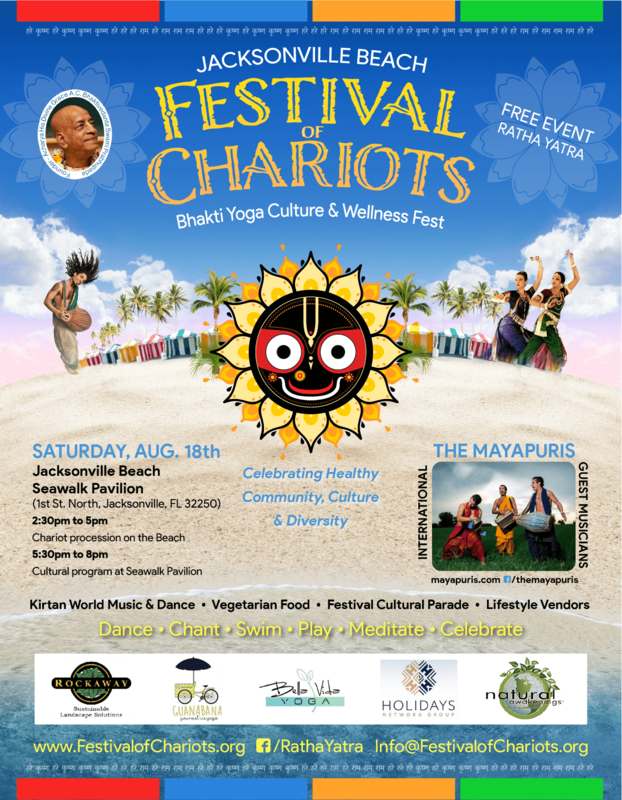 We arrived at the festival site to a prasadam feast and a kirtan led by the Mayapuris. As a service to all of the devotees on her birthday, Mrkanda Prabhu’s daughter Madhuri, along with Anapayini’s sister Ranganayaki, performed a dance for the pleasure of Lord Jagannatha, followed by another dance performance by two of the Bhakti Kalalayam Dance Academy’s youngest students. The New Raman Reti Players performed their play about how the Lord has come to save Mother Earth in various ages when she was endangered by the materialistic ways of her inhabitants, and how the Lord has come again in this age to save Mother Earth by the process of Harinama Sankirtan. The evening was then closed with another ecstatic kirtan led by the Mayapuris. 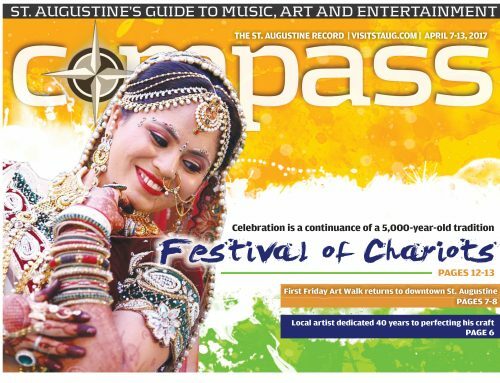 Seeing the cooperation of so many Vaisnava families to organize this festival for the pleasure of Srila Prabhupada and for the benefit of all the conditioned souls in Daytona Beach was heartwarming for me, and I pray that I can also be engaged in the highest welfare work of spreading Krsna consciousness like them.